The New Paris congregation belongs to the Christian Church denomination officially named The Church of the Brethren. Owing to her European roots in the Pietist tradition, The Church of the Brethren has placed emphasis on conversion and a close relationship to Christ. In addition, due to Anabaptist origins, the Brethren have consistently claimed to be a New Testament Church. And, further, to claim a distinction shared with only two other Church bodies; that of being a Peace Church. As such, on grounds particularly of the teachings of Jesus in the Gospels, Brethren stoutly insist that war is sin and that Christ followers should not bear arms in combat, or ever with intent to harm other persons. This peace position is the official doctrinal teaching also of the Society of Friends and of Mennonites. This strong Brethren focus on teachings of the Gospels (the evangels) qualifies the Church to claim the adjective evangelical, as this word is used everywhere in the world outside the USA Protestant and centered on the Gospel. There is a large majority of Brethren, worldwide, who claim the status of being evangelical also in its common American meaning. Thus, The Church of the Brethren is a diverse group of faithful disciples of Jesus Christ. 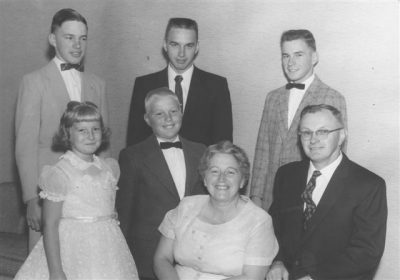 We Brethren trace our origin to a group of eight Germans living in west central Germany in ca. 1700. They were under persecution for the above-mentioned peace convictions and, as Anabaptists, for insisting that infant baptism was unscriptural. Salvation could be gained only by intentional confession of sins and profession of faith in Christ as savior. Only then could one qualify to receive the rite of New Testament baptism. These eight Germans, five men, and three women, in 1708, under the leadership of Alexander Mack, took the radical step of deciding to be publicly immersed in the River Eder near Schwarzenau. After receiving this baptism by trine immersion (three dips), they organized themselves in some fashion to become a congregation of New Testament Christian believers. Just 11 years later, in 1719, a large company of friends of and perhaps also followers of Alexander Mack, agreed to flee persecution in Germany and set sail for America. Their leader was Peter Becker. Their ship docked at Philadelphia, so they made their way to the warmly hospitable German community in nearby Germantown. There they organized the first congregation of Brethren in America. Ten years later, Mack arrived with his family and another large group of Brethren. From that small beginning, Brethren spread out across Pennsylvania colony, with its large German and Quaker populations. From there they soon began to migrate south in numbers, and in greater numbers toward the west. In the late 19th century, Brethren continued their migration all the way to the west coast, planting Churches along the way. Solomons Creek was one of the early Brethren congregations in northern Indiana. Solomons Creek was born in 1856, with the midwife services of Turkey Creek Church Elder Henry Neff. Until 1864, the members worshiped in various localities such as barns and school buildings. In that year, members got property three miles south of New Paris and then built a gigantic (60 x 80 foot) frame Church House. It came to be known among Brethren around a wide area as The Big House. But Solomons Creek congregation definitely was not yet done with mission outreach! In ca. 1885, they purchased a Methodist building located right in New Paris, and offered it to whatever group of Brethren was living in the area. The group accepted the offer and began to hold the first Brethren worship services in New Paris. According to Brother Iverson Mishler, they met for worship more or less regularly until, at the latest, 1899. It was in that year that Solomons Creek sold the building to the Fisher Brothers for use as an implement warehouse. Charles Rock was the choice for what we today would call construction superintendent or general contractor. Rock was eager to build economically, so he recommended that he use hollow tile in the building. The erection of the House was progressing nicely. The basement was dug and poured, the building framed, masonry work finished, and probably a steeple in place, when disaster struck. It was ca. 6:00 on a warm, still July evening. Workers had quit for the day and gone home. The children who often came by to watch the builders at work had been called home for supper. There was no one on the scene watching or listening as strange sounds began creaking from the building. Then followed a thunderous crash as everything moveable fell into the basement. It was a builder’s worst nightmare! The collapse was due to the failure of the hollow tiles to carry the weight above, most likely, in particular, the weight of the steeple. That disaster devastated the morale of the New Paris Brethren. Nothing was done at the disaster site until the next spring (1917, a lapse of ca. eight months). The Church was then rebuilt. The dedication was held in December 1917. Since the dedication was in December, it was probably close to Christmas day. At the time of its organization, the New Paris congregation had the following ministers/Elders (charter members): Charles Arnold, William Buzzard, and J. Henry Warstler. Then, on 12/7/21, Council agreed to test the waters. The agenda included calling a minister. A committee took the voice of the church for the election of a minister with the result that there was no choice made. Council did, however, move on to consider election of deacons. It succeeded in calling three deacons: J. Abe Neff (then a widower) and the Josiah Weltys. But those who pursued this goal of calling a minister were not discouraged! They continued their efforts. Once more, in 11/22, Council agreed to consider calling a minister. On that occasion, Council had success and licensed into the ministry two Brothers: Levi Arnold and Russell V. Bollinger. Council voted to ordain Bollinger two and a half years later, on 5/29/25, and Arnold on 12/5/29. There was a persistent minority in the congregation who, almost from the beginning, believed that New Paris should have a pastor. Council, in 1928, heard a request for a pastor to aid the Elder. Council did not see a need for such a person, so action was deferred indefinitely. This request for a pastor recurred in 1930, 1939, and again, in the forties. On each of these occasions, it was a subject of respectful consideration. In 1930, Council even appointed a study committee. But the proposal just did not have broad support, at least not among those who attended Church Council meetings. It was an idea whose time had not yet come. Not until 1954 was there official Council expression of interest in employing a pastor. On 12/9/54 Council received from the Official Board, with no recommendation, the following item of business: The idea of considering a pastor. Council acted to postpone the matter until the next quarterly meeting, with the proviso that there be some advance notice and open reminders. A majority was willing to give the issue prayerful thought and open consideration. At that next meeting, Council debated the issue. It approved a motion to require a two-thirds majority for action. After much discussion Council voted on a motion to invite the District Ministerial Board in for a consultation. It was found that 47 were no and 35 yes. That vote settled the matter for one year. Then in 1956, the Official Board decided to renew the pastor issue with Council. At a meeting on 9/6/56, the Board suggested that Council select a date for a special council meeting where the matter could be discussed by all members of the church. Council agreed and directed that the Ministerial Committee make proper contact [with the District Ministerial Board], set the date and report. A date was set. Three weeks later the Council met in special session. In addition to the pastor issue, Council added to the agenda election of an Elder/moderator. Just as we should expect, Elder Evans, having already served for 13 continuous years, was elected. New Paris at that time was electing Elders for one-year terms. Again Council faced the pastor issue. E. Wayne Gerdes was present to represent the District Board. He chaired an open very helpful discussion. We get no hint as to how it was helpful. The sense of the meeting was that Council was not yet ready to confront and vote on the issue. Instead, it acted to refer the matter back to the Ministerial Committee to schedule another special meeting! That directive included, of course, inviting the District Board to be present once more to facilitate the dialogue. Council did act at that time to up the ante. It set 80% support as a minimum standard for positive action on the pastor issue. That seemed to be a wise decision, but what it actually accomplished was to enable 20 persons to block what 79 others wanted! That next special meeting took place again just three weeks later. That time, two men came from the District Board: Gerdes and Harper Will. The men proceeded as follows: Each member of the church present were [sic] urged to pass before the Board and express their views on the question. The outcome was about 75% of the vote was in favor of a pastor and 25% against. It was a failing vote. The clerk read the minutes and the meeting was closed in prayer. Still, no decision was reached. At the next regular Council meeting, on 12/6/56, the issue recurred. After considerable thought and discussion Council, still unready, directed the Ministerial Committee, once again, to contact the District and arrange for a special meeting! Council ordered that, at that next meeting, the following two issues must be settled! 1) a vote percentage needed for approval; 2) settle the pastor issue once and for all! Another date was soon set. That special meeting took place on 1/3/57. After some brief discussion, a motion was made and seconded to rescind the action of a former Council requiring a majority vote of 80%. The motion passed. It remained only for Council to rule that the 75% vote of the previous meeting in favor of hiring a pastor was a valid vote. There was a strong vote in support of this motion. Council then acted to affirm support of the Ministerial Committee and to direct them to move ahead as a designated pastor search committee. Case closed. The struggle was ended! Within three months, the pastor search process resulted in the choice of a candidate. Front row: Beth, Roger, Helen, and Kenneth Hollinger. The New Paris Church of the Brethren had made its landmark decision to employ a salaried pastor. The pastor search committee had been hard at work. It had arranged for the Church family to entertain candidate pastor Kenneth Hollinger, and wife Helen, at a mutual get-acquainted fellowship meal. The date was 3/25/57. Council assembled on 4/23/62 to receive the Petrys for a mutual get acquainted visit. The minutes do not give us many details, but clearly, the experience was mutually pleasant. Six days later, Council met in special session. It cast a strong vote to call Edgar G. Petry as the second pastor of New Paris. He began his ministry ca. September 1st. Front row: Dean and Mary Kaye Rohrer. 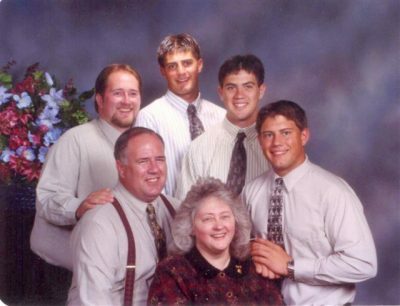 Back row: Phil, Tim, Steve, and Sue Hendericks. 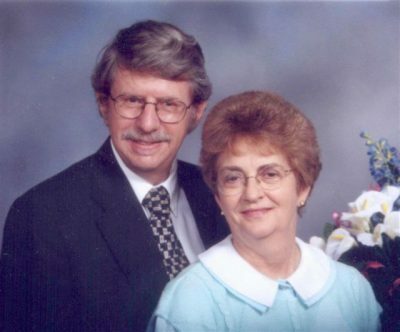 Tim and Sue were later to marry. August 22, 1973. 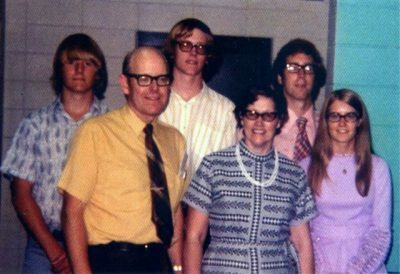 Pastor Dean Rohrer began his pastoral regime in September 1969. He gave his first report to Council on 10/29. The minute presents just one fact from his report, membership stood at 336. Rohrer gave his second report on 1/21/70. At that time he shared that the congregation had already made a major evangelistic effort called Operation Upsurge. It involved 23 teams making door to door calls. They visited in 157 homes taking literature and the new Church Directory. Eight new members joined seven by transfer of letter and one by confession of faith and baptism. One must say that this was an impressive beginning for a new pastorate! The Ministerial Commission of the Church met on 4/9/73, by which time they had received a letter of resignation from pastor Rohrer. Immediately they set in motion selection of a pastor search committee. In less than two months the extremely efficient search committee, together with the Ministry Commission, had basically finished their assignment. They had consulted the District Executive, identified a lead candidate, gotten his agreement to come for a visit, and negotiated a date for a special Council meeting. 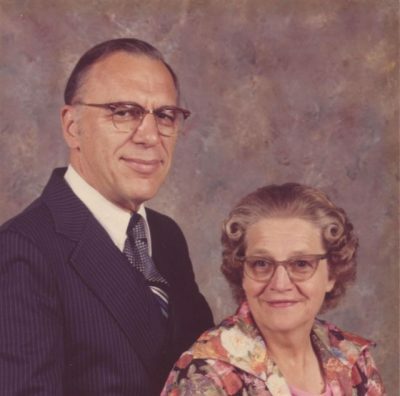 So it resulted that on 6/20 the congregation met in the Church fellowship hall to welcome J. Earl and Pearl Hostetter for a mutual get-acquainted encounter. Council minutes report as follows on the meeting. After Rev. Hostetter was introduced he gave a sermonette [trial sermon?] Pearl also gave a short talk. A question and answer period was held with informal refreshments following. The Hostetters made a very favorable impression for the Council of 100 voters almost unanimously extended the call for J. Earl Hostetter to become the fourth pastor of New Paris. It was during the month of May that the committee arranged for Arlin and Helen Claassen to come to New Paris for mutual introductions. That encounter was a positive experience for the members present. A couple of weeks later, Council met in special session to cast a nearly unanimous vote in favor of extending a pastoral call. Thus, Arlin Claassen was scheduled to become, on 9/1/84, the fifth New Paris pastor. 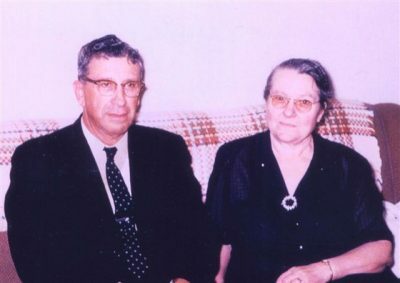 John and Mary Whitcraft at a special meeting on 10/16/86. The vote was a strong call to employ him as interim pastor. He accepted and was ready to take charge on 11/1. Then in 1987, the Board and Council agreed that the interim status of John Whitcraft should be regularized. The search committee seeking an associate pastor continued at work. John Plank, for the Commission, reported on 1/20/88 that they are going to ask a boy and girl from the youth group to serve in the interviewing process. This was an extremely important change from what was general practice. Finally, on 5/8, after nearly a year, the Commission was ready to report to a special Council meeting. It recommended that Council call Mike Overpeck to be the next associate pastor. 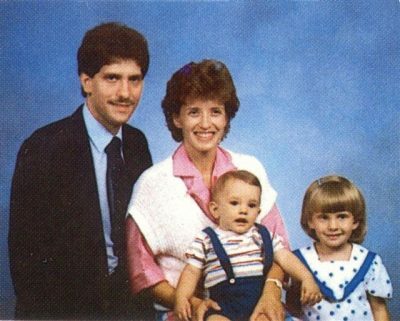 Mike would later on become Senior Pastor. Front row: Ron and Julie Scherck. Back Row: Hannah, Leah, Jonah, Ezra. October 29, 2000. Ronald G. Sherck II. was identified as the candidate whose pastor profile fitted perfectly with the profile of the congregation. Council agreed to invite him and Julie to a special meeting on 5/9/93. They agreed and came. Council was pleased with the choice of the committee. It called Ron Sherck as the eighth pastor of New Paris. Pastor Sherck assumed pastoral duties at New Paris on 8/1/93. 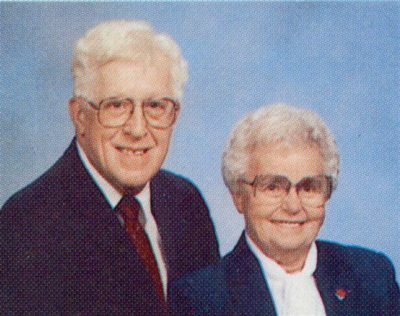 By 4/29/98 the pastor search committee had examined many files of applicants and narrowed the search to Stanley L. Godfrey, Jr. 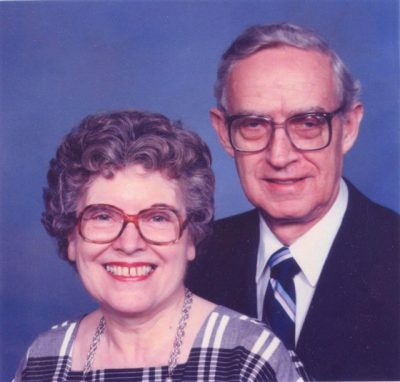 Thus, it came about that on 5/24/98 Stan Godfrey, together with his wife, Nancy, and four sons, arrived at New Paris to preach a sermon and to test the waters. The Board had announced a special Council meeting for the same day. Godfrey preached well, so he passed the most obvious test. Then the Church family entertained the entire family at a fellowship meal and it was, indeed, a fellowship meal. Following dinner, the congregation met in Council, District executive Kauffman presided. As is customary, the congregation quizzed the candidate. We also had a question or two for the rest of the family. The Godfreys, in turn, had a few questions for the Council. When everyone was ready, Council voted on the call. Well impressed by the candidate, Council voted almost unanimously to call Stanley L. Godfrey, Jr. as next pastoral leader of New Paris. 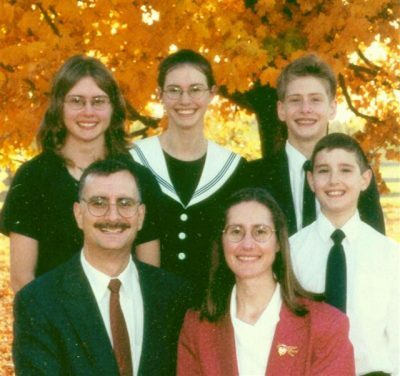 He began pastoral duties in August 1998.